A cargo jet filled with 110 tons of relief supplies for victims of Typhoon Haiyan arrived in Cebu City Sunday morning local time. 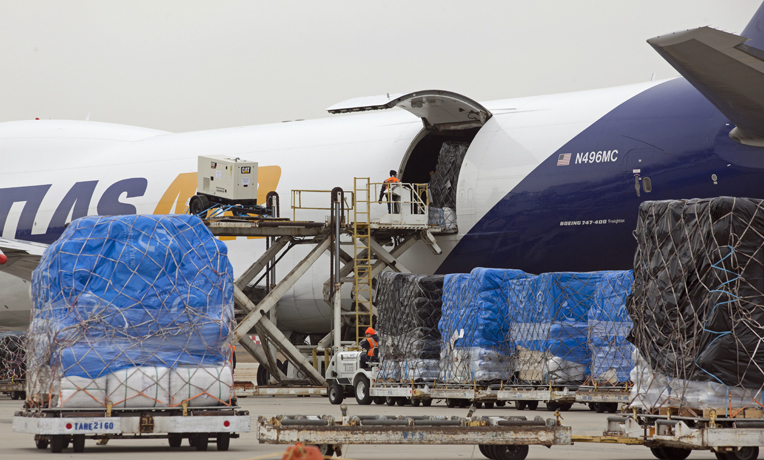 The Boeing 747 was loaded with 3.6 million square feet of plastic sheeting, six community water filtration systems, bladder tanks and tap stands for water storage and distribution, medical supplies, mosquito nets, and blankets. It left Charlotte, North Carolina, on Friday afternoon. 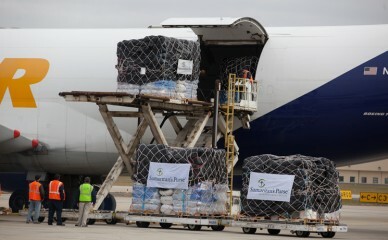 The emergency relief supplies arrive in the Philippines, where they will be used to help alleviate the suffering of storm victims. The plane was met by members of our disaster relief team, which are working with local partners to coordinate and deliver desperately needed aid to victims of the typhoon. In addition to the airlift, Samaritan’s Purse is currently working with local volunteers in Cebu City to assemble thousands of hygiene and food parcel kits for typhoon victims, which are being distributed on the islands of Cebu and Bantayan. 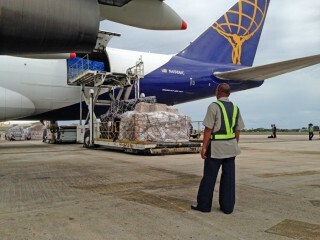 Among the supplies on the aircraft are eight palettes of medical supplies and medical equipment that will be used to help reopen Schistosomiasis Hospital in Tacloban. The hospital was abandoned when the typhoon hit and hasn’t been able to treat any patients since. Our staff, including biomedical technician Jim Moore and Dr. Lance Plyler, along with a volunteer medical team are working to get the hospital up and running again so that it can provide much-needed medical aid to storm victims. Samaritan’s Purse has worked in the Philippines for more than 15 years, deploying disaster response teams and working through local partnerships. Last month we provided relief to residents during rebel fighting and after a deadly earthquake. In December 2012, Samaritan’s Purse responded to a typhoon in the Philippines that caused at least 1,900 deaths and widespread destruction. Typhoon Haiyan is a record-breaking disaster with sustained winds of 195 miles per hour, gusts up to 235 mph, and storm surges along the coast of more than 20 feet. At least 2,500 people have been reported dead and more than 580,000 are displaced as the disaster has destroyed many homes all over the country.